Say the word “Casablanca” and it immediately conjures up the 1942 movie with Humphrey Bogart and Ingrid Bergman. But during World War II, Casablanca was more than just a waystation for refugees attempting to flee Hitler’s armies. As the largest African port on the Atlantic, Casablanca became a key military objective for the Allies, prompting the United States and Britain to send General George S. Patton and 33,000 troops to take the city and French Morocco from Vichy France. For the 75th anniversary of Operation TORCH, author Meredith Hindley takes a new look at the role of Casablanca in World War II. 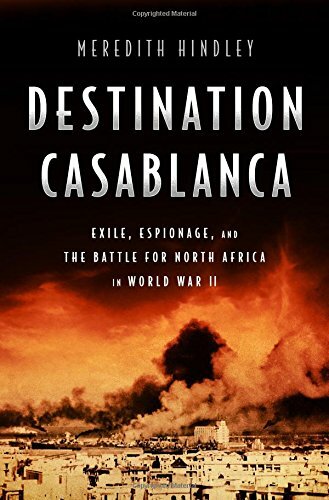 Meredith Hindley is the author of Destination Casablanca: Exile, Espionage, and the Battle for North Africa (PublicAffairs, 2017). She is a historian and senior writer for Humanities, the quarterly review of the National Endowment for the Humanities. Her scholarly credits include articles in Holocaust and Genocide Studies and Intelligence and National Security. She has also written for the New York Times, Salon, Lapham’s Quarterly, Longreads, and elsewhere. Hindley received her Ph.D. from American University.